The Dodgers started Preacher Roe, who with a gaudy 22-3 record had to instill confidence in the Brooklyns. The disappointing fifth-place Phillies, coming off their Cinderella Whiz Kids season the year before, started Bubba Church. Bubba possessed one of the best curveballs in the league and his 15 wins were second most on the club (behind Robin Roberts, who had 21). Church escaped a first-inning one-out, first-and-third jam by serving up a double-play grounder to Jackie Robinson. On the other side, Preacher surprisingly didn’t have it as the Phillies showed by chasing him with a four-run second. A lead-off solo home run by Tommy Brown, a run-scoring double by Eddie Pellagrini, and a two-run infield single by Richie Ashburn were the big blows. The Dodgers plated a run in the top of the third on Pee Wee Reese’s run-scoring triple to right, but the Phillies came back in the bottom half with two more runs. Church, an excellent hitting pitcher who batted .256 for the season, singled sharply to right to plate the two runs off reliever Ralph Branca. It looked bleak for the Dodgers, down 6-1 in the fourth, with the scoreboard showing the Giants leading the Braves 3-1 late in the game. Brooklyn managed a second run in that inning on a triple by Roy Campanella and an infield error to make it 6-2. After Clyde King, another Dodger reliever, held the Phillies scoreless in the fourth, the resilient Dodgers put together their first real rally of the game, scoring three runs to close the score to 6-5. Robinson’s one-out triple was the key hit and chased Church from the game. But it looked like the Phillies’ day when, in the bottom half of the inning, Granny Hamner followed Bill Nicholson’s single to right with what looked like a similar shot to the same field. But as right fielder Carl Furillo went to field the ball it took a bad hop and bounced over his head for a run-scoring triple. It was the fourth triple of the game in five innings. Pellagrini drove in Hamner with a single to left and the Phillies again had some breathing room, 8-5. Phillies manager Eddie Sawyer showed that he was pulling out all the stops by bringing in ace Robin Roberts to pitch to Furillo. It was something of a surprise move because Roberts had pitched eight innings the day before in a 5-0 loss to the Dodgers. Furillo, however, singled to left to score pinch-runner Don Thompson with the tying run before Roberts could get out of the inning. Dodgers manager Charlie Dressen was also leaving it all out there and brought his ace Don Newcombe in to pitch the bottom of the eighth. Newcombe had also pitched the day before, tossing a seven-hit shutout against Philly. The two 20-game winners quelled any further scoring as the game went into extra innings with both still on the mound. At one point, Roberts retired 10 Dodgers in a row, while Newcombe was almost as effective. In the bottom of the 12th the Phillies mounted a serious threat when Roberts, hitting for himself, led off with a walk. Pellagrini bunted and both runners were safe when Roberts beat the throw to second. Ashburn hit a two-hopper to Hodges; his only play was at first so the runners advanced to second and third with one out. A run would win it for the Phillies and end the Dodgers season. Brooklyn intentionally walked Willie Jones to load the bases and set up a force at any base. Del Ennis was next and worked the count to 2-and-2 before taking a called strike three for the second out. That brought up Eddie Waitkus, who smashed a low liner to the right side of second base. 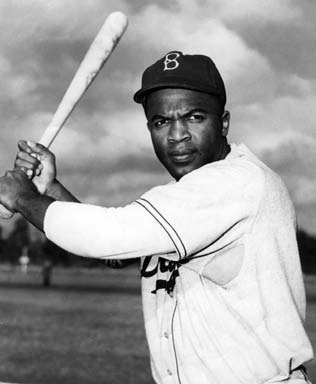 Jackie Robinson, playing second, dived for the ball, reaching across his body with his glove hand inches above the ground. He landed hard with the ball in his glove and immediately rolled over and weakly tossed the ball toward second base, as if he were attempting to get a force out there, before collapsing on the infield. Neither team scored in the 13th inning, although the Phillies again threatened. After Newcombe tired and walked two in the bottom half with two outs, Bud Podbielan relieved and retired Pellagrini on a fly to Duke Snider in center to end the inning. Roberts continued to sail along and in the top of the 14th quickly retired Reese and Snider on harmless foul popups. The smooth sailing stopped abruptly with the next batter, Jackie Robinson, who was still in the game after his hard dive. With the count 1-and-1, Robinson got hold of a high fastball and sent it far into the left-field stands for a solo home run and a 9-8 Brooklyn lead. Campanella doubled to left but Roberts bore down to retire Pafko on a grounder to short to end the inning. The tension continued in the bottom of the inning as Ashburn led off against Podbielan with a line-drive single just over Reese’s outstretched glove at shortstop.9 Jones sacrificed Ashburn to second to bring up Ennis, the Phils’ cleanup batter. He worked the count full before popping up to Hodges at first for the second out. Waitkus was next but could not deliver, flying out to Pafko in left to end the drama and the game. The Dodgers, of course, went on to lose a dramatic three-game playoff for the pennant to the New York Giants on Bobby Thomson’s famous “Shot Heard ’Round the World” off Ralph Branca.10 But without Robinson’s spectacular catch in the bottom of the 12th, there would have been no playoff and Bobby Thomson would be remembered as a solid player who is the only major-leaguer born in Scotland rather than as the architect of the most dramatic home run in baseball history. But did Jackie Robinson really catch Waitkus’s liner in the 12th? The Phillies to a man thought he trapped the ball. Russ Meyer was so vocal from the Phillies bench that he was almost ejected.11 Roberts believed that Robinson’s wild toss of the ball from a prone position toward second showed that Jackie thought he had trapped the ball and was desperately trying for a force at second. The author accessed Baseball-Reference.com for box-score/play-by-play information (baseball-reference.com/boxes/PHI/PHI195109300.shtml), as well as Retrosheet.org (retrosheet.org/boxesetc/1951/B09300PHI1951.htm). 1 Roscoe McGowen, “Brooks Beat Phils in Fourteenth, 9-8,” New York Times, October 1, 1951: 26. 6 Robin Roberts and C. Paul Rogers III, My Life in Baseball (Chicago: Triumph Books, 2003), 104. 7 Carl Lundquist, “Drama in Philadelphia: Jackie’s Forgotten Day,” The National Pastime No. 26 (1997): 4. 8 Frederick G. Lieb, The Philadelphia Phillies (New York: A. S. Barnes & Co., 1953), 234. Another account had Robinson jamming his shoulder. McGowen, 26. 12 Roberts and Rogers, 105.